Sometimes painting steel or using stainless steel is not good enough. You need material that has 100% chemical resistance – Fiberstrut. Have you ever used Unistrut HDGal or zinc plated channel (strut) to mount pipework or equipment in a corrosive environment? This presents difficulties, as the only way to ensure chemical resistance is to coat the Unistrut with epoxy paint. However, we all know that this paint coating is only good as long as it is not scratched or broken. Once the film of paint is broken, corrosion begins and will spread throughout the steel under the remaining paint. It is usually not possible to coat the inside of the channel with paint and even if it can be done, a channel nut must be installed on the inside of the channel. Once an item is clamped to the channel nut, it will pull up hard against the inside lip of the channel and scratch off any paint, exposing it to corrosion. The result we see in chemical plant rooms is the visible after a few years. In the first year, everything looks good. After that, corrosion becomes visible and after longer periods, mechanical failure can occur. It is just not possible to ensure 100% corrosion resistance using steel and coatings. Usually, you will go to a lot of trouble to ensure that all of the materials used in contact with chemicals is compatible – dosing pumps, pipework, elastomers, fittings, boards. Then the dosing system is mounted onto steel channel using steel channel nuts and bolts. This is crazy and bad engineering practice. One comment we hear a lot is: “it will be o.k. There will never be chemical in contact with the steel anyway – our systems don’t leak and there won’t be a spill”. Let’s get real about it. Even in the best systems, leaks do occur and fumes do happen occasionally. If your system is not maintained perfectly, something may leak. If they want to remove a pump for maintenance, chemical may be released. That one time is all it takes for corrosion to start. Wouldn’t it be great to walk into a plant room and see the whole room looking brand new (just like the day it was installed)? With Fiberstrut (Aickinstrut) you can. We have had the privilege of visiting some fluorosilicic acid (FSA) dosing system plant rooms after 10 years operation. There is no corrosion visible anywhere. The dosing skid is HDPE, bolts Fiberstrut (Aickinstrut) vinylester, pipe clips polyurethane, threaded rod vinylester and channel vinylester. Plant operators love Fiberstrut (Aickinstrut) as no corrosion equals better reliability and lower maintenance costs. System builders love Fiberstrut (Aickinstrut) as their reputation is enhanced by building systems which last. If you are looking for Fiberglass or FRP channel, pipe clips, threaded rod or brackets, Fiberstrut is exactly that. Fiberstrut bolts, nuts and washers are very good for mounting chemical dosing pipework and equipment in corrosive environments. The bolts have good tensile and shear strength and connect with the Fiberstrut channel nuts with Fiberstrut channel. Sizes available are 1/4″, 3/8″, 1/2″, 5/8″. You can use 1/2″ or 5/8″ bolts to clamp pipe flanges. Materials include polyurethane, vinylester and PVC. 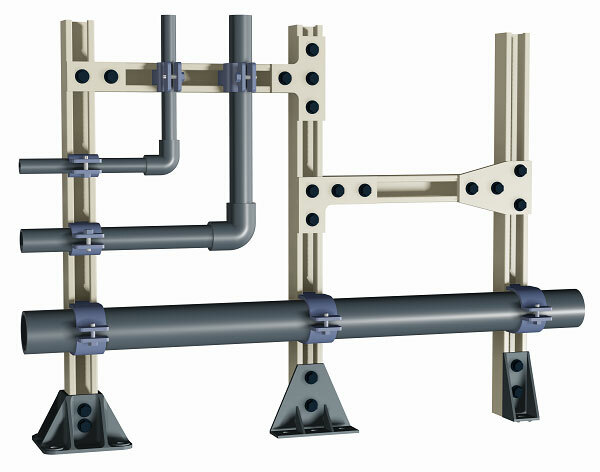 The Fiberstrut (Aickinstrut) channel (strut) has its own unique profile suitable for Fiberstrut (Aickinstrut) channel nuts and pipe clips (different to the Unistrut profile). This non-metallic channel is available in polyurethane, vinylester, PVC and stainless steel in sizes: heavy duty (1 5/8″), medium duty (1 1/2″), light duty (1 1/8″) . Configurations include standard, slotted, with concrete inserts and back to back. Standard channel length is 10 ft. Channel capping strip is available to make the installation neat and to prevent dirt ingress. Channel end caps protect operators from cut ends. Fiberstrut channel can be easily cut with a hand saw or powered saw. Wet saws are ideal as they prevent dust during cutting. Fiberstrut (Aickinstrut) pipe clips enable connection of pipe and conduit to Fiberstrut channel. Clips are sized perfectly for Sch80 PVC in sizes: 1/2″, 3/4″, 1″, 1.25″, 1.5″, 2″, 2.5″, 3″, 4″, 6″, 8″. Each pipe clip (clamp) comes with 2 sides, bolt and nut. Simply slide into the channel and tighten onto the pipework. No need to use cushion between the clamp and pipe. Brackets are available to configure Fiberstrut frame at right angles, in rectangles, at right angles, tees and almost any other way imaginable. Brackets are joined to channel with bolts and channel nuts. Post bases are fastened to the ground using Fiberstrut threaded rod which is chemset into concrete or masonry. Channel is then pushed into the top of the post base and acts as a strong vertical piece. Fiberstrut (Aickinstrut) threaded rod is available in vinylester and polyurethane in 1/4″, 3/8″, 1/2″, 5/8″ and standard 8 ft legnth. Fiberstrut has been used for many years on chemical dosing skids for chemicals such as sodium hypochlorite, sulphuric acid, fluorosilicic acid, hydrochloric acid, gas chlorine and chlorine dioxide. Fiberstrut has been successfully used in thousands of applications throughout the world. Some of those applications include: pulp and paper, refineries, chemical plants, chemical dosing systems, waste water treatment, marinas, desalination facilities, aquariums, theme parks and underground vaults. Fiberstrut can be used in demanding environments where steel strut systems have traditionally failed. Fiberstrut is an alternative to Unistrut where corrosive fumes or atmospheres are present. “I personally like the concept of the Fiberstrut system. However like all things it has its own unique strengths and weaknesses which means it is not a silver bullet for all situations. But if you are aware of the weaknesses you can maximize the benefits from the strengths. The Fiberstrut system is chemically resistant and will not suffer the aesthetic and structural issues of Gal, Aluminium and Stainless steel, when in contact with the usual water treatment chemicals. However it doesn’t have the strength inherent in those products so it needs to be braced and supported in a more considered and thought about way. it won’t span as far, it doesn’t have the same resistance to bending, and will break rather than bend when pushed beyond its limits. That being said I would prefer to make Fiberstrut the default specified system in our chemical rooms and where appropriate, allow the alternatives rather than the other way around, as it will, when used properly, be the same on the day of install, as what it will be at time of commissioning. When you are designing and building a plant with a 20 – 50 year life, the initial capital cost is less important compared to the service life it affords, if the product is ½ the cost and works for a ¼ of the life you aren’t really ever in front. Download the Fiberstrut catalogue for a complete parts listing.